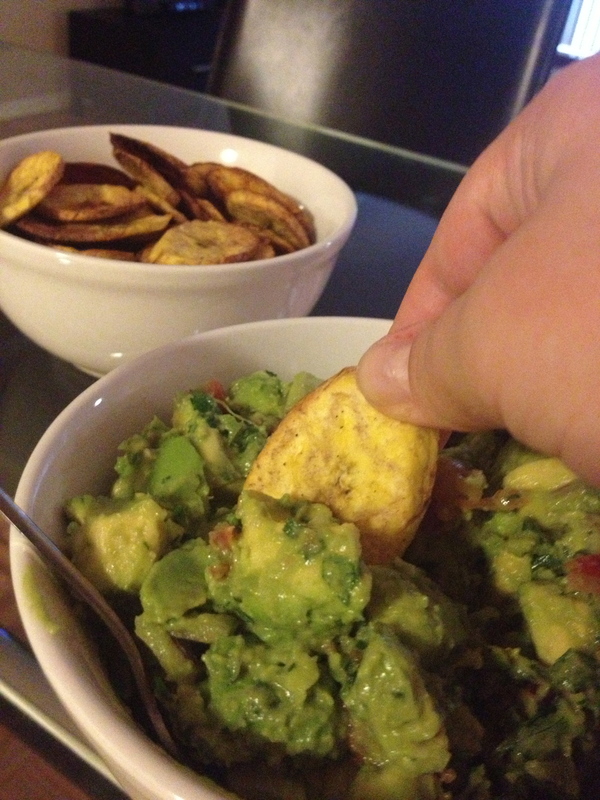 Remember our plantain chips, my Amazons? Well, surely you’ve been racking your brains coming up with things to put on them. Rack no more! I’m going to share with you my super secret, extra special, bestest guacamole recipe! Ok, it’s not really that secret, but it IS one of my most requested dishes. Guacamole is, at its heart, extraordinarily simple. A bunch of produce chopped up and mixed in a bowl. But choosing your produce and dispatching it efficiently are a little more complicated. First things first. When choosing your avocados, you have to take into account when you’re planning to use them. 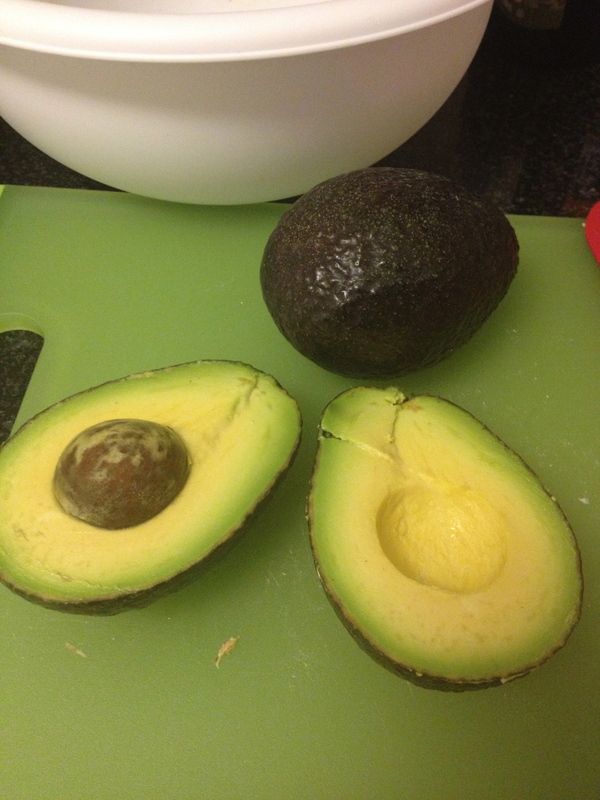 The ideal avocado for guac today is black on the outside and gives easily to a little pressure, but not squishy. 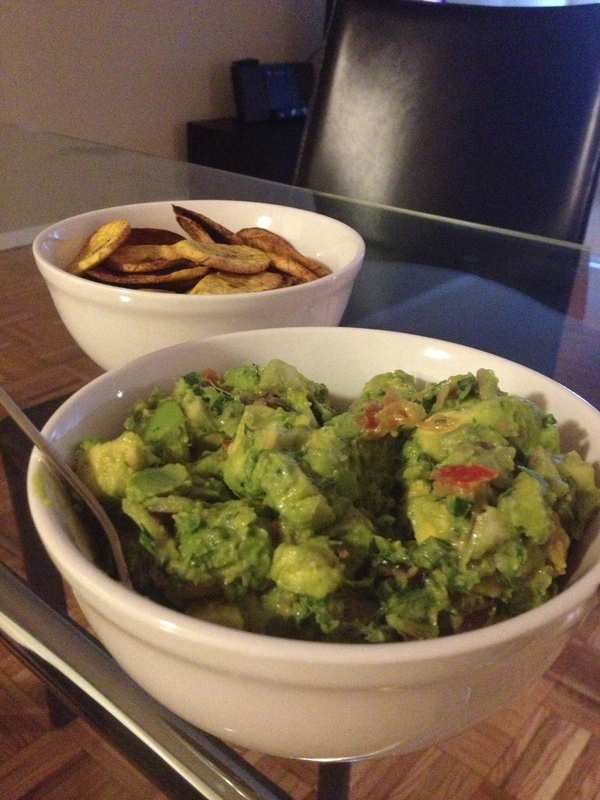 If you want to make guac tomorrow or the next day get something a little greener and firmer. If you need to speed up the ripening process for some reason, place your avocados in a paper bag and they’ll start softening right quick. The most controversial ingredient in this guac is probably the cilantro. Cilantro is known as coriander across the pond (we’re referring to the seed instead of the herb when we use the word coriander in the US), and for some people it tastes like soap… and they find this unpleasant. This is genetic, kind of like whether you can smell asparagus pee or not. If you’re one of these aberrations of nature, simply leave out the glorious deliciousness that is cilantro. No hard feelings. 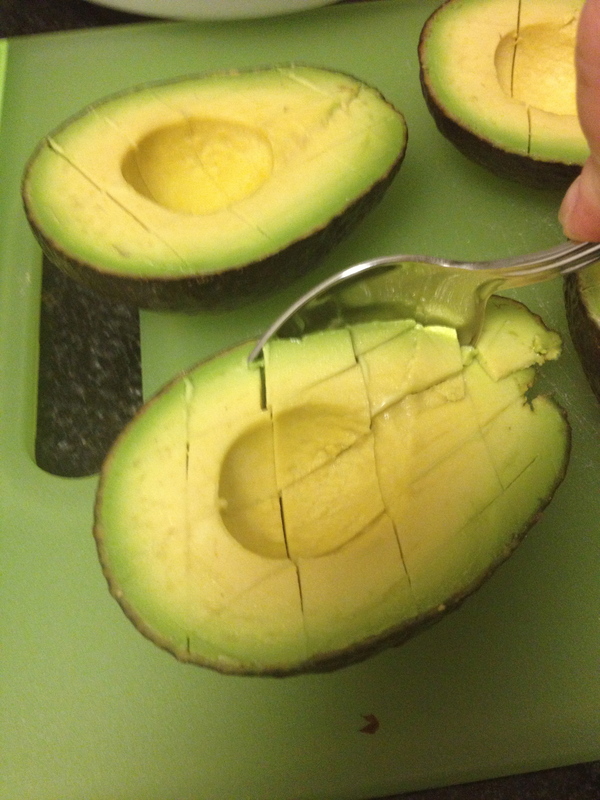 If you’ve never opened up an avocado, it takes a little practice, but I’m going to tell you my favorite way. 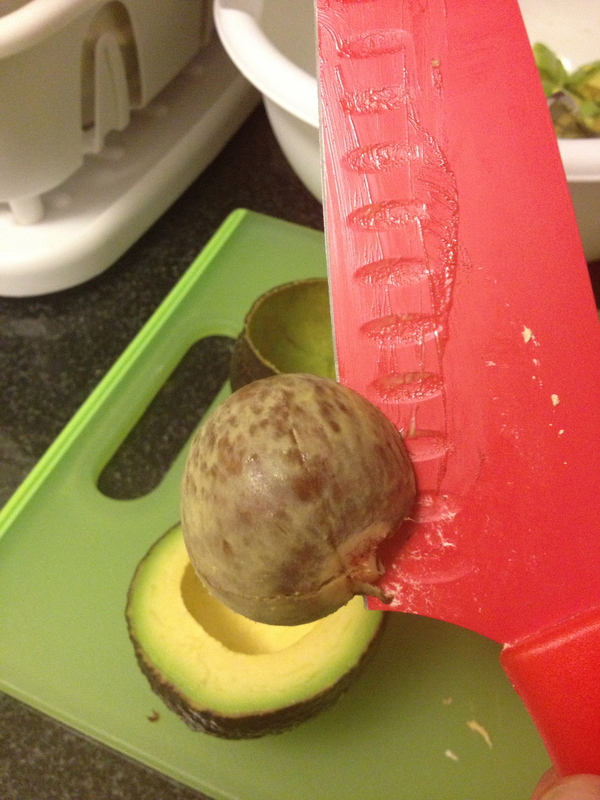 Start by slicing into the avocado lengthwise in your hand. Normally, I don’t recommend cutting things in your hand, but this is one of the rare moments where it really is the best way. If you’d like extra protection, cover your hand with a kitchen towel or oven mitt. Back to the slicing! Once you hit the pit inside, continue running the knife along that lengthwise all the way around the fruit until you’re back where you started. At this point, you should be able to twist the fruit so that it falls into two halves, with the pit protruding from one of them. Ok, this is the scary part. I wouldn’t even let the children be in the room for this part. They’ll get ideas. And children never need extra ideas. To remove the pit, hold the fruit in your non-dominant hand while swiftly and confidently hacking the heel of the knife into the pit. You want it to be one, sure movement. Hesitations can be dangerous, so be sure, my Amazons! And for heaven’s sake! Make sure your knives are sharp! When the knife is lodged in the pit, twist the knife and the pit should slip right out, no problem. Now, how to get the pit off the knife? Very simple. Reaching around the non-sharp edge of the blade, simply push the pit off with your fingertips. This next bit is another piece of cavalier and dangerous knife business. Default to your favorite knife. Basically, you’re going to score the avocado in the peel, running the knife through the flesh, but NOT through the peel in a grid. This will allow you to spoon neatly diced chunks easily from the peel into the bowl, saving you a lot of hassle. My preference for guacamole is a slightly chunkier texture, so I’m going to discourage you from mixing or stirring until you have all the ingredients in the bowl. If you like a more puréed or mashed guacamole, go crazy and stir any time you like! Layer in your tomatoes, garlic, onion, and chopped cilantro (except for you weirdos). For those of you unfamiliar with capsicums or hot peppers, there are a few cardinal rules. Number one is NEVER TOUCH YOUR EYES OR ANY OTHER MUCOUS MEMBRANES AFTER HANDLING BEFORE WASHING YOUR HANDS. 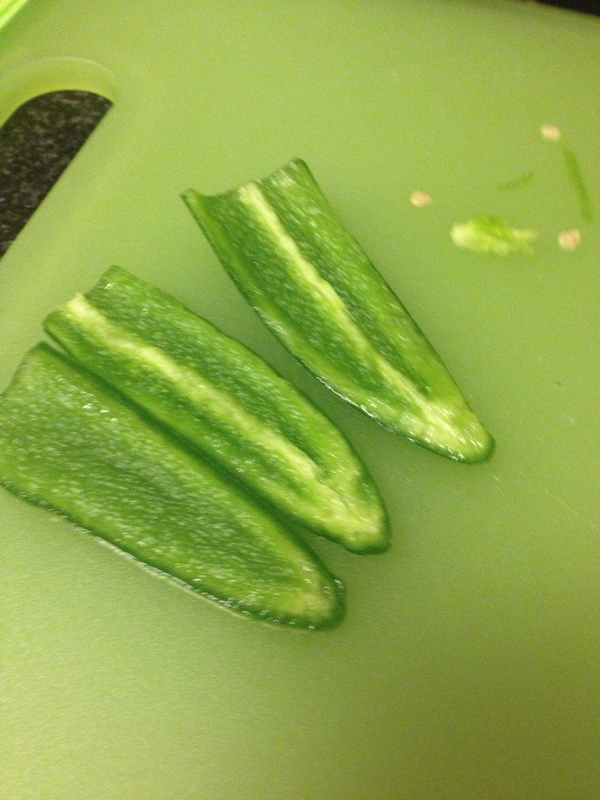 Number two is that the majority of heat from peppers comes from the seeds and white ribs on the inside of the pepper. You can control the level of heat in your guac by controlling how much of those two things get into your mix. Personally, I like a low spice level, but I love the flavor of jalapeños and the slight kick they bring, so I usually remove all the ribs and seeds before mincing. Removing the ribs is done by flattening the pepper on the board and scraping your knife horizontally along the rib, shaving it off. Ok, what’s left to add? Limes and salt. Why do I leave these ‘til the end? They are the most variable ingredients in the bunch. They are completely to taste. I’d recommend adding the juice of one lime and a healthy pinch of salt before mixing and then taste, taste, taste. If it needs more acid, increase your lime. Coming off a bit bland? More salt. When it makes you smile, you’ve nailed it. You are ready to party! Now, on the very unlikely chance that you have leftovers there is one way to keep your guac from going brown on you. There are loads of old wives’ tales about leaving the pit in the guac or lemon juice preventing browning, etc., but the one true way is plastic wrap. It’s exposure to air that makes avocado go brown so fast, so how do we prevent darkening? Remove the air! Place the leftovers in whatever container you like and press the plastic wrap right on top of the guac in complete contact end to end. Do you have favorite variations on guacamole? Fun food facts to add? Please share with your fellow Amazons in the comments! We’d love to hear from you!